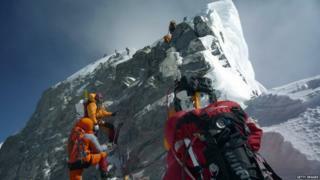 Too much poo and wee is being left behind by climbers on Mount Everest, the world's highest mountain. It's causing pollution and could spread disease, says the boss of Nepal's mountaineering association. Ang Tshering wants Nepal's government to ask climbers to get rid of their waste properly. He says poo and wee have been "piling up" for years: "Climbers usually dig holes in the snow for their toilet use and leave the human waste there." More than 700 climbers and guides spend almost two months on the mountain slopes every year. Base camp is about two-thirds of the way up Mount Everest. 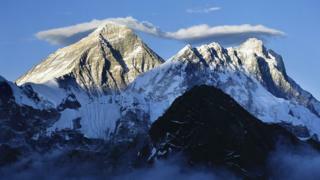 There are actually two base camps, North in Tibet and South in Nepal. There's a clear season for climbing the mountain, which began this week and ends in May. During the rest of the year the weather is too bad. "It is a health hazard and the issue needs to be addressed," says Dawa Steven Sherpa, who has been helping to clean the mountain since 2008. He says that some climbers do carry disposable travel toilet bags to use in the higher camps. At base camp there are toilet tents, which have special drums to contain human waste goes. These can be taken away from the mountain and emptied safely. But the camps further up, between the base and the summit, don't have toilets. 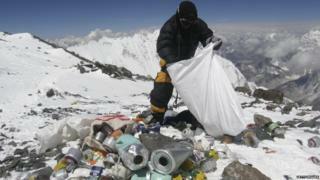 Nepal's government hasn't yet made any rules about poo and wee up the mountain - but they are trying to stop the amount of rubbish that's left on the slopes. New rules mean each climber must bring 8kg of rubbish back with them when they return to base camp. That is the amount experts think a climber has to leave up there when climbing Everest.